Xeriscape gardening is a good way to cut down on water usage while still having a beautiful, low-maintenance landscape. Keep reading for tips on creating a water-efficient garden. Many people associate water-efficient landscapes with sand, gravel, cactus or scarce plantings, and a desert-looking appearance. On the contrary, a successful water-efficient garden is a balanced landscape that uses water efficiently and balances the lawn area, shrubs, and flowers with the surrounding hardscape. By applying a few simple guidelines, your lawn and garden can cope with drought conditions while minimizing water waste, as all too often water is applied inadequately, resulting in significant waste due to over watering, evaporation, or runoff. Another good way to cut down on watering is to reduce the size of your lawn. You can either plant more drought-tolerant ground covers or increase the size of your hardscapes, such as patios and decks, in place of traditional lawn grass. With a little planning, your lawn and garden can be both beautiful and water efficient. 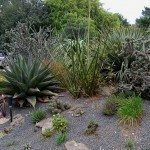 Xeriscape gardening is the creative use of native plants that are beautiful, drought-tolerant, and sustainable. The key to successful xeriscaping is plenty of research and planning beforehand. Start by walking around your lawn to determine the best way to implement your xeriscape design. Think about how you want to use your space, and plan accordingly. Design for your site and your needs. Consider the specific conditions of your yard, taking into account that water requirements will differ in shady areas versus sunny spots as well as slopes, flat areas or depressions. Some places, such as narrow side yards, may be hard to water. Find out what type of soil you have and improve its water retention capabilities; for example, amend the soil with compost to improve its overall health. Group plants with similar water needs to make watering more efficient. Shrubs and perennials, for instance, should be grouped together in mulched beds. Size your lawn area to meet your practical needs for play and traffic. Choose plants that are well adapted to your climate and site conditions. In shady areas, use shade-tolerant plants or consider a woodland shade garden. In sunny spots, use drought-tolerant, sun-loving plants or consider a low-maintenance wildflower meadow. Drought-tolerant plants perform quite well on slopes. Consider using moisture-loving plants in lower areas of the lawn. Use mulch and an efficient irrigation system. Mulch helps retain moisture and eliminates the need for weeding. Organic mulches will also break down into the soil over time, further promoting its health by adding nutrients. One of the best methods of watering is drip irrigation or with the use of soaker hoses. These allow the water to slowly soak into the ground, reaching the plant roots and eliminating the need for constant watering. 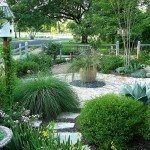 If you have chosen the proper plants and designed your xeriscape accordingly, the end result will be a beautiful, water-efficient garden that your neighbors will envy.